The Whiskey King Blog: Two Years... Just Getting Started! Two Years... Just Getting Started! Two years isn't much time to fully develop, but it is plenty of time to begin revealing potential. 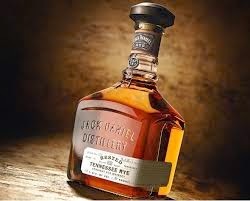 I am very excited to try Jack Daniel’s Rested Tennessee Rye. Being a huge fan of rye whiskeys, I was thrilled to see that the Jack Daniel Distillery was sharing a special limited release of this work in progress. Reported to have a taste that is a collection of fruitiness and vanilla and a spicy aroma of rye spice, oak spice, clove and black pepper. I am heading out right now to pick up a bottle for another two year celebration. Enjoy this limited release! I know I will.